This month’s Recipe Redux theme is Green with Herb Envy. Even though St. Patrick’s Day is over, March is also the beginning of spring, so it is only fitting that green be featured in the theme. And while there are plenty of things to do with herbs, the challenge was to use an herb in a non-traditional way. The only herb that I have growing fresh right now in abundance is rosemary. I have some thyme and my oregano and parsley are beginning to grow, which is exciting. But my rosemary bush is becoming a monster. The more ways I can find to use it, the better! I also happened to pick up some Meyer lemons the other week at the grocery store and hadn’t had a chance yet to do anything with them. While I toyed with the idea of a cookie or even shortbread, I just couldn’t bring myself to do it. My Scottish grandmother would certainly disapprove of me ruining her shortbread recipe with rosemary and Meyer lemons. That left the muffin, probably my favorite baked good anyway. During my internet research, I came across a recipe on Buttered Up that I knew I could improve upon. And I believe I accomplished that and then some. I was even surprised that my sick 4 year old ate one. I was sure he wouldn’t like it but he did! I used less sugar so it is really not a very sweet muffin except for the sugar and lemon zest topping, which really makes the muffin. 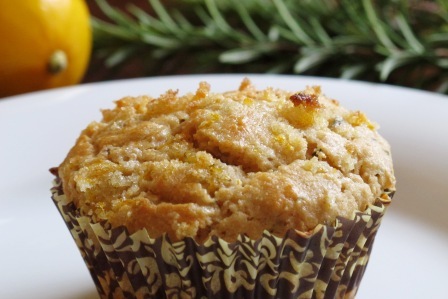 Rosemary and Meyer lemons are paired in this not-too-sweet and savory muffin. Preheat oven to 375°F. Line muffin pan with paper liners or use cooking spray. In a small bowl, mash ¼ cup of the sugar with the lemon zest until well combined. Set aside. In a large glass, combine milk and lemon juice. Stir and set aside. In a medium bowl, stir together flour, baking powder, salt, and rosemary. Using an electric mixer, cream together the remaining ½ cup of sugar and butter. Add in the egg. Then add the Greek yogurt, milk mixture, vanilla and half of the lemon sugar, beating well after each addition. Slowly add in flour mixture and mix just until combined. 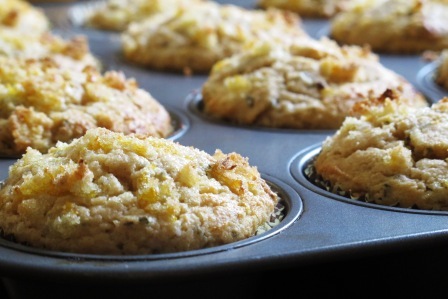 Scoop batter into muffin pan. 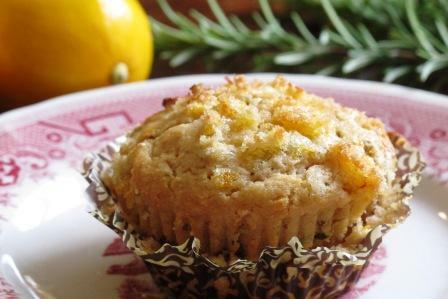 Sprinkle remaining lemon sugar over the top of each muffin. 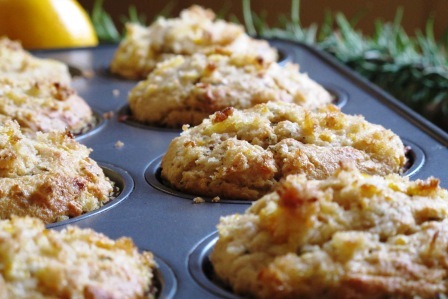 Bake muffins for 20 minutes or until lightly browned and toothpick inserted into center comes out clean.